Three years ago I saw Takayama in Winter. It was cold, snow piled on the side of the streets. Hida Takayama, in the mountains north of Nagoya, was definitely attractive in the cold months. I remember the oblique light, the dark wood of the ancient houses, the empty streets and the rumbling sound of the river. And then I can still feel on my skin the hot water of the onsen in the old minshuku where we were the only guests. And then I remember the sweet and unforgettable taste of Hida beef, cooked with hoba miso on a magnolia leaf. Now I can hardly recognize the city as I am trying to find my way among the cheering crowds that fill the space between stalls selling kebab, okonomiyaki, crepes and cans of beer alongside the traditional rag dolls and seasonal fruits and vegetables. Three years ago we visited the Takayama matsuri yatai kaikan, the museum of the two great festivals, matsuri in Japanese, held from the 17th century in spring and autumn (April 14th-15th and October 9th-10th). And while we watched with amazement the huge, ancient festival floats, which are dragged through the streets during the matsuri, me and my girlfriend Letizia imagined to return one day to see the event. It seemed only a vague thought, a fantasy. But we did it for real. We booked the hotels six months in advance (it wasn’t easy), we traveled for over four hours from Tokyo and now we’re here. Not only with my wife: with us there is also a group of friends, relatives, there are also my little nephews of one and three years. And we are here for real. I love to go back to places I’ve visited, but I never believed it would happen so soon. Takayama festivals are traditionally considered among the most beautiful of Japan together with Gion Matsuri in Kyoto and Chichibu Yomatsuri. The highlight of the festival is the night parade, yomatsuri, with ten large floats, that takes place at the end of the first day of matsuri. The two matsuri are named after the sanctuaries to which they are dedicated. The spring festival, which takes place in the southern part of the town, is called Sanno Matsuri and it’s considered more spectacular (the floats are also pulled over a bridge). 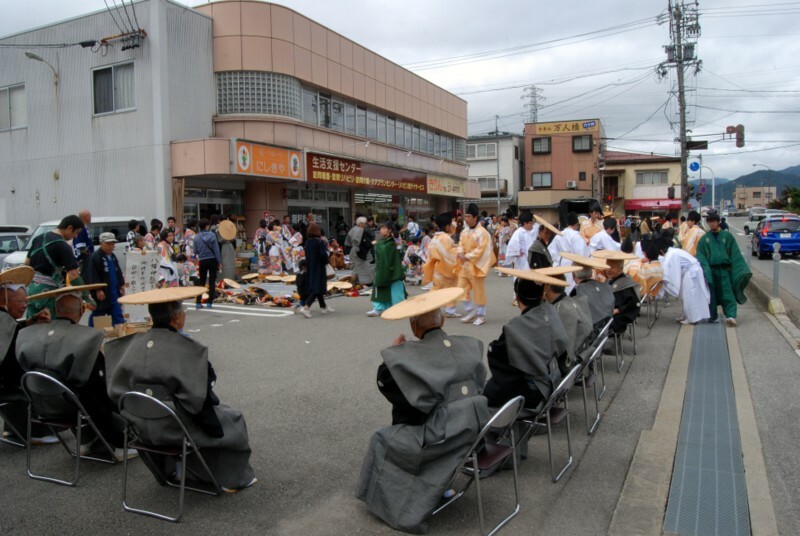 The fall festival is called Hachiman Matsuri and takes place in the north side of town. The floats are over twenty, and only a couple are used in both celebrations. Originally, the two festivals celebrated the end of winter and the end of harvest. In bad weather, even light rain, the procession might be canceled. And that is why today I woke up with fear, hearing the noise of heavy rain, which I usually find relaxing. So much effort could have been useless. But now the sky is opening up and my heart feels lighter. And around the tall storehouses, where the floats are kept most of the year (while some are in the museum), scattered in the old city, I can already see the preparations: many men wearing dresses of times past, fumbling with ropes and wooden poles. The first parade is at one p.m., and it only involves four yatai, but it’s the one that starts everything. Before the start of the procession, the floats are displayed (with great effort to park them) in front of the Shinto shrine of Hachiman, where usually gathers a huge crowd. It’s already an awesome sight. The stalls along the Miyagawa River, where every morning there’s a market, during the matsuri sell typical Japanese street food such as okonomiyaki (the famous Japanese ‘pancakes’) and takoyaki (octopus dumplings). Then there are the expensive Hida beef skewers (6-700 yen each! ), the meat buns (nikuman) and sweets of all kinds. Many people buy the food and then sit along the river with their family or friends. It goes on like this until night. “The Goshinko procession is not to be missed”, tells me a volunteer. It’s held both the first and the second day of the festival and sometimes is overlooked. But it really is a beautiful sight: a portable shrine, called mikoshi, is carried through the streets of the town with a big procession of priests, townspeople in costumes, musicians and… lions. The lion dance, called Kinzoujishi is a centuries-old tradition passed down among the youth of the town: it cleanses the city from the demons. Lions sometimes even enter houses. I follow the procession, almost hypnotized by music, rituals and sounds of another time. For a moment I remove from my sight all the tourists lined up along the streets. I feel like I am time-travelling. Then suddenly the procession stops in front of a supermarket. It ‘s time for a break. Folding chairs and tables come out of nowhere, and then bottles of sake and cigarettes, cell phones and snacks. Suddenly I find myself in the middle of an ancient-Japan themed picnic in a parking lot. Perhaps we are late. The night procession, scheduled for 6 pm, is about to begin, but the streets are already crowded, they are overflowing with people. I also notice a change in the crowd: foreigners seem to have disappeared and now there are mostly Japanese. They are locals, and their relatives, I guess. But probably there are also many Japanese tourists: they are, I guess, the ones who had already filled all the hotels six months ago. Eventually we find a narrow street that leads to the one where the procession takes place, around halfway. We’ll just have to wait a while: the yomatsuri procession lasts for three hours. And the yatai will arrive where we are around 7 pm. Then, a bit earlier than I thought, I hear a distant echo of drums. It’s approaching slowly and then I see a faint glow on the front of an old wooden house. The first of the ten yatai is coming. Then I understand why the yatai were early. Halfway through the procession they stop and line up in the city center. There is a lenghty break and four groups of boys re-enact the lion dance, the Kinzoujishi, in front of a huge crowd. Towards the end, I leave the crowd and walk briskly to regroup with my wife and friends, who have already gone to Takayama ramen, for a warm bowl of noodles: it’s in the same street, but on the other side of the bridge, not far away. While I walk I pass in front of one of the storehouses, empty and lit by a faint blue light. There is no one, apart from an elderly man. Everybody else is at the matsuri. And suddenly I realize that all the drums and the flutes are gone. I hear only silence. How to get there. Takayama (Hida Takayama) is a JR train station. If you arrive by train from Tokyo or Kyoto is advisable to use the Japan Rail pass as the journey is long and costs about 10.000 yen. From Kyoto you can get to Takayama in three hours. There is a train change in Nagoya (from there it’s 140′ on an Express train). From Tokyo it takes about four hours and you have two options: you can change in Nagoya or you can take the shinkansen to Kanazawa and change in Toyama. From there it’s just over an hour with the express. I also took the bus from Kyoto once, a good option for those who don’t have the Japan rail pass. The train. The Hida Express (Tokkyu train) from Nagoya or from Toyama has wide windows. It takes its passengers through wooded dales of great beauty. Make sure to do at least one trip in daytime to enjoy the panorama. Close to Takayama. There is Shirakawa-go and its old gassho zukuri farmhouses. You can get there by bus (45′, 2,470 yen each way) and then continue to the beautiful Kanazawa which is quite close. The matsuri take place on April 14th-15th (Takayama Sanno matsuri or spring festival) and 9th-10th October (Hachiman Matsuri or Takayama Autumn festival). It’s recommended to book your accommodation at least six months in advance. Consider doing it earlier if the festival is on a weekend. The highlight is the evening procession at the end of the first day. The second day is more low-key. Recommended accommodations. We particularly like minshuku Kuwataniya (where you eat well, if you choose half board), the oldest in town, and ryokan Iwatakan, both with a convenient location and a beautiful onsen for guests (the latter also has a rotenburo, outside bath).